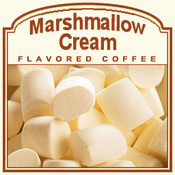 Marshmallow Cream flavored coffee is an intoxicatingly aromatic coffee that features the sweetness you love from sticky, gooey marshmallows. Made with 100% Arabica beans, this Marshmallow Cream will remind you of your favorite marshmallow treats such as s�mores, rice krispies, and of course, marshmallows covered in decadent fondue. Light and fluffy, just like a marshmallow should be, this flavored coffee will be a delicious delight. Shipped and sealed in a heat-sealed valve bag to ensure the freshest coffee possible, this Marshmallow Cream flavored coffee will be roasted and shipped on the same day. Go ahead and enjoy a cup of this sugary-sweet Marshmallow Cream without the sticky fingers!